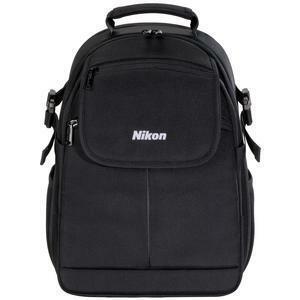 Carry gear comfortably in this compact, lightweight backpack. 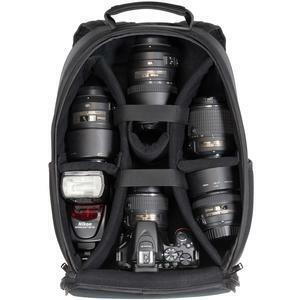 The Nikon 17006 Compact DSLR Camera Backpack Case has a compact lightweight design and is ideal for travel, day trips and weekend hikes. 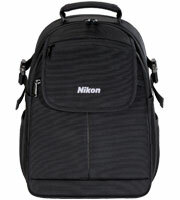 It features a quick access front pocket for small accessories, personal items and even a small tablet. Secure your gear with the padded, adjustable interior. 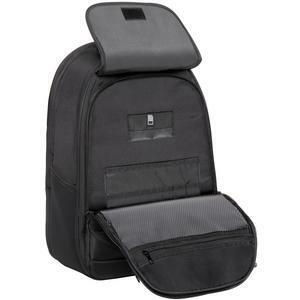 This backpack also features a padded rear zippered compartment for a small laptop computer or large tablet. Wide, adjustable shoulder straps make carrying this case very comfortable, and it also features a padded hand grip for convenience. It is constructed of tear-resistant nylon and soft polyester. 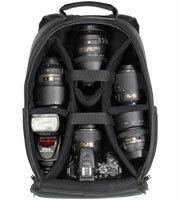 Fits: One DSLR with lens attached, 4-5 extra lenses, a flash, 15" (diag.) laptop or tablet, memory cards, card reader, spare batteries, smartphone, plus accessories.